He usually can only stay awake long enough to find out 3 facts but, for Austin, his 4th fact was SO fascinating, he just couldn’t bear to leave it out! Austin is famous for the bat population which congregate around the Congress Avenue Bridge at sunset. Across the season (March – September), an estimated 1.5 millions of the creepy little beasties will fly in and out. This means that Austin is the city with the largest bat population in North America. Travel Bug visited the bridge during daylight hours, just to be sure he’d be safe. He’s seen The Lost Boys…he knows what happens when the sun goes down. Austin’s state capitol is larger than the US Capitol Building in Washington D.C, making it the largest in the whole of America! It’s also pink. No, really. Travel Bug took a quick flight over it, just to make sure his friends weren’t kidding. He was very surprised as he’s never seen a pink building before. The colour comes from the pink granite that was used during construction. TTB is now considering running for Bug Governor of Austin as he’d quite like an office in this pink house. Yep; you guessed it – Austin has its very own Yeti. In the small town of Round Rock, just outside the city limits, several sightings have been made recently. And by ‘recently’ Travel Bug means June 2017, which is maybe a little *too* recent for his liking. As well as local agencies, even the FBI have gotten involved in the search. It’s not the first time that Texas has been visited by the creature, with sightings also reported back in 2012. The National Park Service has even managed to obtain grainy footage of the ‘hairy man’ having a quiet stroll around Round Rocks Park. After all, even Big Foot needs exercise, no? Travel Bug has decided that he’ll maybe take his humans with him when he goes out and about in Austin from now on. Former President, Lyndon B Johnson – who was sworn in when JFK was assassinated – came from Austin. This means that there’s a whole lot of stuffs about him in the city. He has a library and museum in Austin and, while TTB was researching the President, he realised that LBJ was married to a Lady Bird!!! She’s even got a park named after her where you can take your bug on bike and walking trails! 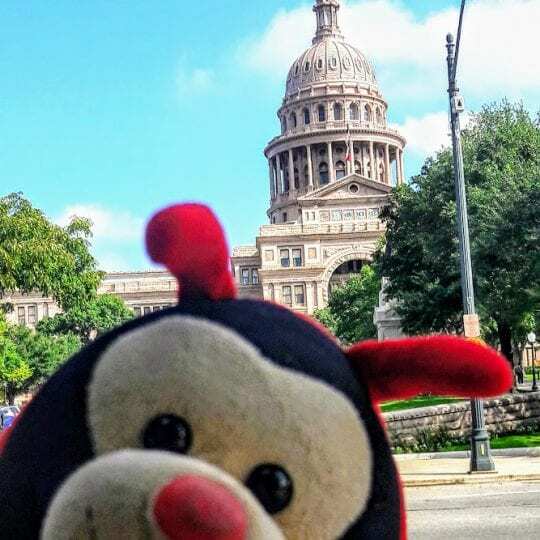 Travel Bug has never seen *anything* named after a Lady Bird before (except his bedroom at home) and now thinks Austin is the best place on earth. Do you have any more fascinating facts about Austin to share with The Travel Bug?